One of the words we love hearing from couples talking about their wedding planning is “intentional.” Couples are more involved in the details of their day than ever, and they are making choices based on what’s most important to them, rather than what’s trending. When it comes to carrying out their values throughout their day, more and more couples are choosing eco-friendly wedding options to say “I do” with as little waste as possible. In honor of Earth Day this weekend, we’re sharing our favorite eco-friendly wedding ideas! photo by Mango Studios; see more from this wedding here! Isn’t it great when the eco-friendly option also saves you money? Instead of arranging for separate florals for the ceremony and reception, make use of the same designs for both parts of your day. Your ceremony backdrop will look lovely behind your dessert table and your bridesmaids bouquets make for beautiful centerpieces. 2. Dress your wedding party in rented dresses and tuxes. photo by Amber Phinisee; see more from this wedding here! 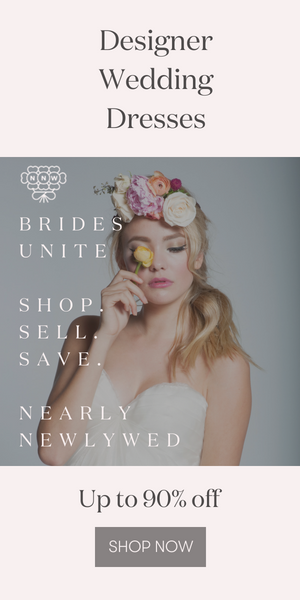 Rather than having each member of your wedding party purchase a brand new garment for your wedding day, consider using a rental service like Rent the Runway or The Black Tux. Pretty as they may be, bridesmaids dresses are rarely re-worn, making a dress rental a great option. 3. Know your headcount and don’t over-order food. photo by Golden Days Photography; see more from this wedding inspiration shoot here! Something not everyone considers when planning their catering is the amount of waste created by over-ordering. Having a set headcount plenty of time in advance allows your caterer to provide the right amount of food for your guests without having to trash the leftovers at the end of the night. Bonus eco-friendly tip? Choose a farm-to-table caterer and treat your guests to a meal made from locally-sourced and earth-friendly foods! 4. Display informative signs in lieu of programs and menus. Pretty paper has been known to make our hearts all aflutter, but printed menus and programs aren’t exactly environmentally friendly. A quick way to reduce your ecological footprint on your wedding day is to display your order of events and menus on signs for all to see. Bonus points for using a reusable surface like chalkboard, glass, or a mirror! 5. Ditch the flower arrangements and decorate with potted plants. photo by Caro Weiss Photography; see more from this wedding here! While flowers, no matter how beautiful, will wilt and be thrown away at the end of the celebration, potted plants are a much more sustainable option when it comes to decorating your day! Maybe it’s just us and our crazy plant lady ways, but we’re totally into the idea of filling your home with plants that were displayed around your wedding. 6. Give plants as wedding favors. image by Let’s Frolic Together view the full feature here! Not only is decorating with potted plants a major trend this season, but you double up on being good to the Earth when you give them away as favors too! Your guests will love having a growing gift to remember your day by, as opposed to a tschotske they might otherwise leave behind. Looking for more eco-friendly wedding inspiration? Check out these 5 DIY wedding decor trends perfect for any skill level!